It is with heavy heart that we learned this afternoon the former University of New Haven, Miami Dolphin and Oakland Raider head coach Tony Sparano passed away suddenly earlier today from an apparent heart attack. He was only 56. 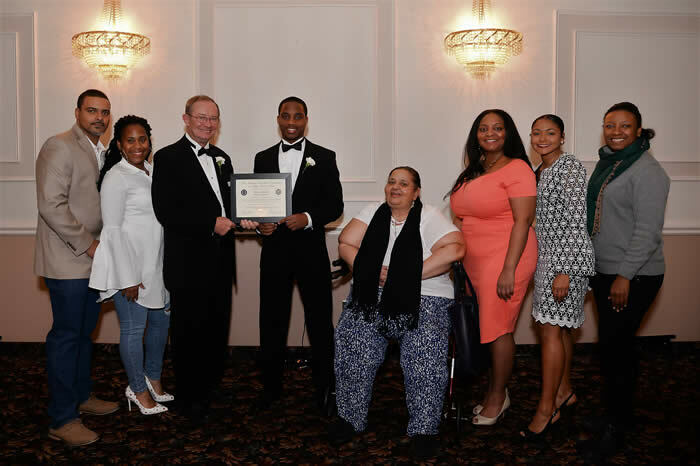 Tony was a graduate of Richard C. Lee High School in New Haven where he played for chapter member Dr. Leroy Williams and then played at the University of New Haven graduating in 1984. He later became the head coach at his alma mater achieving a impressive 41-14 record before joining SCSU grad Chris Palmer with the Cleveland Browns. He later coached with the Redskins, Jaguars and Cowboys before becoming the head coach of the Miami Dolphins. He later joined the Jets and then the Raiders becoming the Interim Head Coach for the 2014 season. At the time of his death he was the offensive line coach for the Minnesota Vikings. 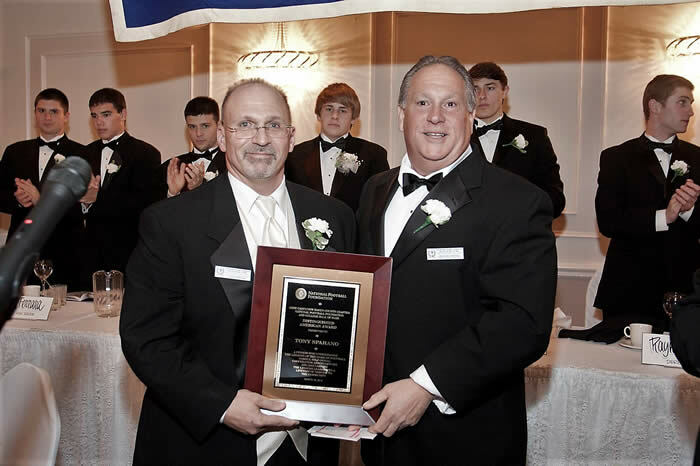 The New Haven County Chapter honored coach Sparano with our Distinguished American Award in 2012. 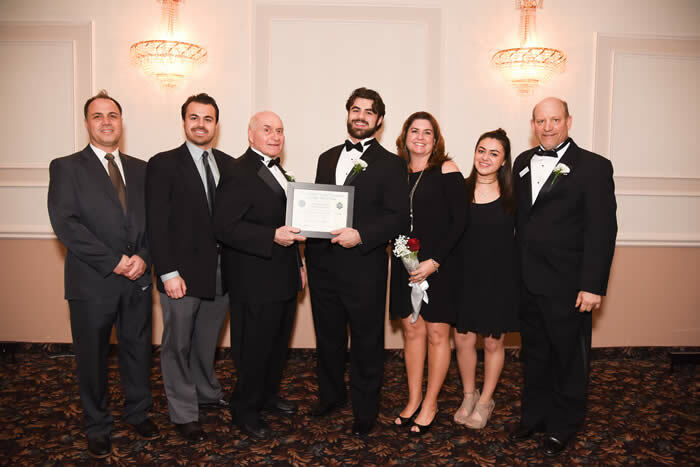 In attendance were his wife Jeanette and their children, his parents, some former UNH players and long time friends and assistants Tony Mortali and Peter Rossomando . 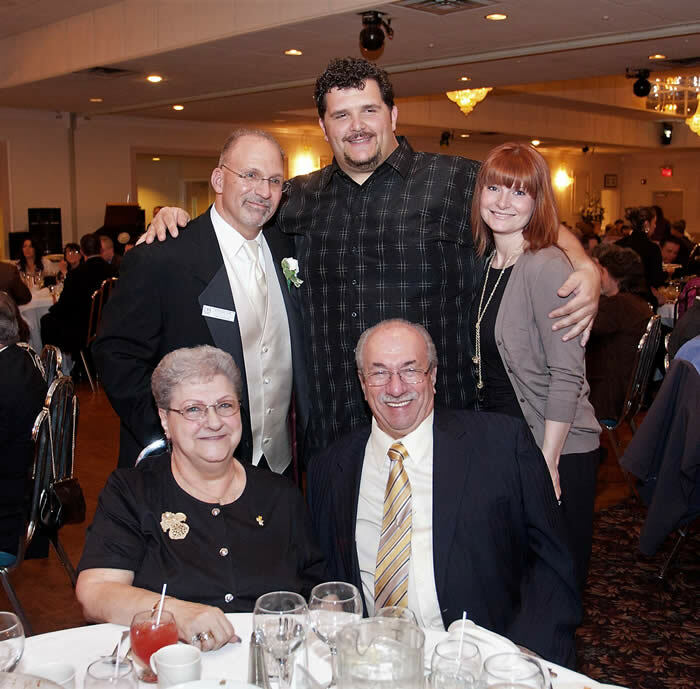 Tony was a friend to many in this area and he will be missed. 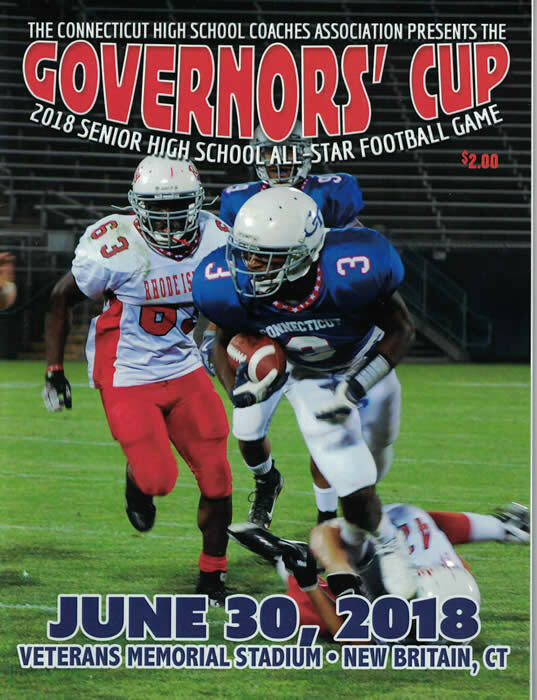 The annual Connecticut High School Coaches Association All Star football game was played at Veterans Memorial Stadium in New Britain on Saturday June 30 at 2:00 pm between graduated seniors from Connecticut and Rhode Island. Seventeen players from our chapters schools played for CT including 15 from the SCC. 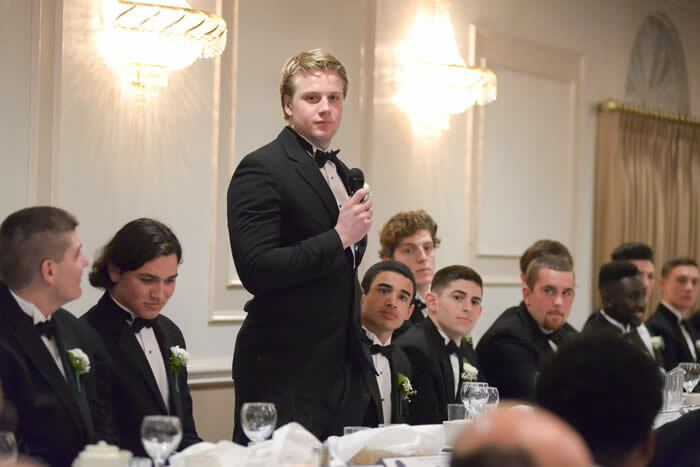 Shelton's Mike Casinelli was chosen to be a team captains along with Will Terzi of Sheehan. 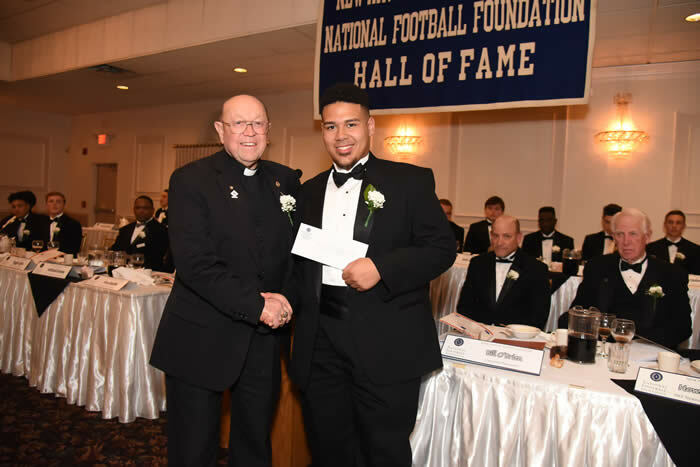 Casinelli was also chosen Connecticut Defensive MVP in the game and Platt's Zavian Arroyo was selected to receive the Connecticut Coaches Award. 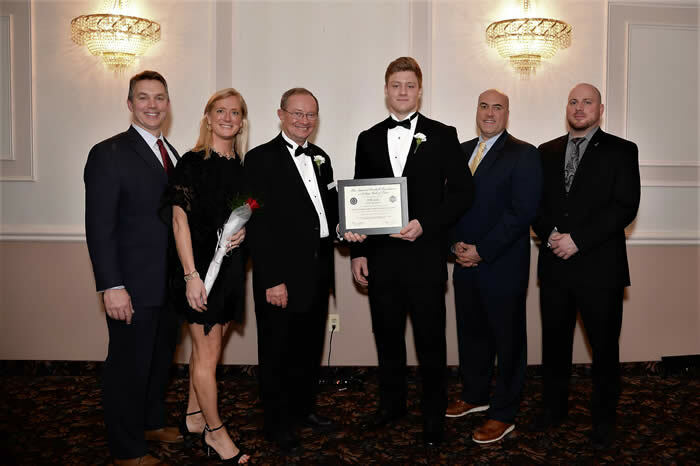 An interesting story this year came with the selection of five scholar athletes that were honored in April at our 58th Annual Scholar Athlete dinner to play for Connecticut. 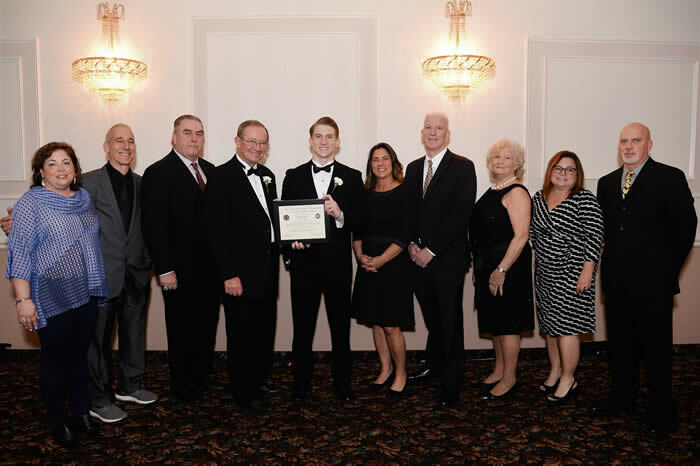 They included Casinelli of Shelton and Terzi from Shehan along with Mekhi Geter of West Haven, Andrew Paulus of Law and Frank Paine of Notre Dame. 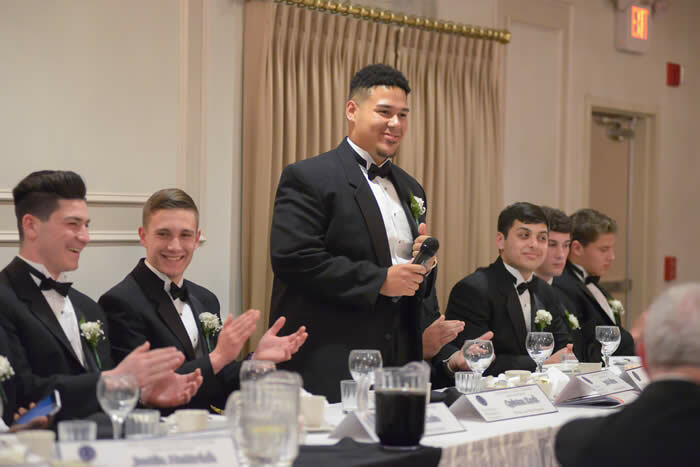 Other player from the chapter included Elijah Felton (Platt), Kwane Taylor (Wilbur Cross), Tommy Donahue (Fairfield Prep), Peter Bencivengo (Xavier), Chris Chance (West Haven), Kyle McGillis (Xavier), Ryan Cartelli (Xavier), Jaryd Witkoski (Shelton), Rickqueal Warren (Wilbur Cross), Joshua Evans (Notre Dame) and Alex Kulasenski (Xavier). 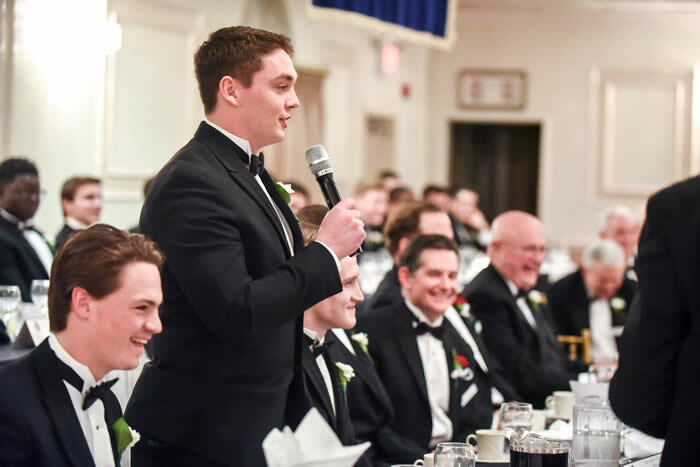 Part of the net proceed from the game will be awarded to the chapter for scholarships at next year's dinner. 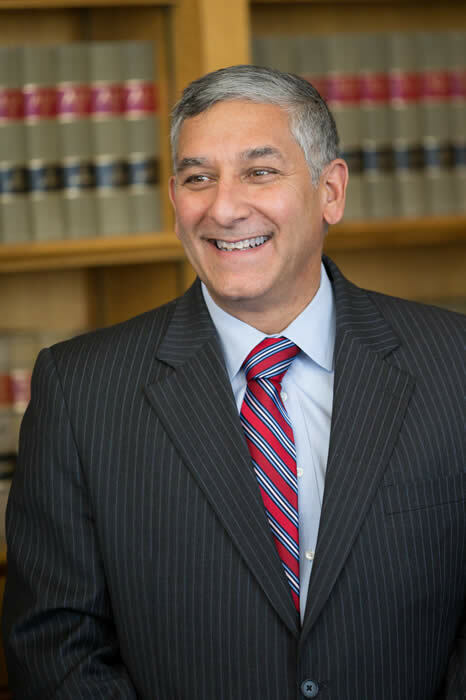 NEW BRITAIN — Two weeks is hardly enough time to install an intricate offense, especially when that offense requires precision and a rhythm from its passing attack. It becomes even tougher when an all-star quarterback gets knocked from the game. On defense on the other hand, once the coverage strategy is established the players can just pin their ears back and play. While offense made its presence felt early, defense nabbed the spotlight in Connecticut’s 28-7 victory over Rhode Island in the revival of the Governor’s Cup Senior All-Star football game on a sweltering Saturday at New Britain’s Veterans Stadium. The victory was Connecticut’s 11th straight in the series, which returned this year after a five-year layoff. Team Connecticut now leads the overall series 12-3. “That’s the thing with these all-star games, they want to gear the rules toward the offense,” said Xavier’s Andy Guyon, the head coach of Team Connecticut. “But the offense has to get clicking. It has to get its timing right. There’s a lot to it. Bulkeley’s Dayjion Washington broke a 7-7 tie with an 18-yard interception return touchdown to give Connecticut the lead for good in the second quarter. With the game still in doubt in the fourth quarter, Hartford Public’s Leon Campbell forced a fumble that Shelton’s Mike Casinelli recovered, which set up the clinching touchdown. “We talked to them at halftime about finishing,” Guyon said. “I give (Rhode Island) credit for coming out and making us coach and making our guys play. They didn’t roll over they came out and played hard. It wasn’t easy. With Norwich Free Academy’s Shea McManaway getting knocked out early in the second quarter, Capital Prep quarterback and Central Connecticut State signee Kyle Zajack played the remainder of the game. 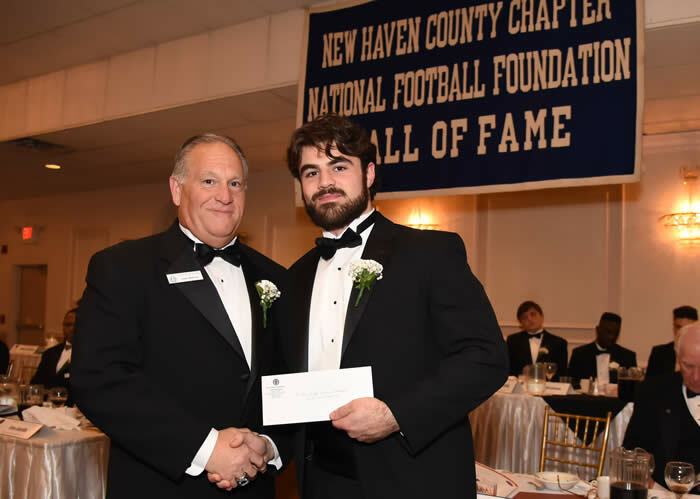 He wound up throwing three touchdown passes to earn Connecticut’s Offensive MVP. Zajack’s first touchdown was a 64-yard strike to Simsbury’s Ralph Gilliard early in the second quarter. 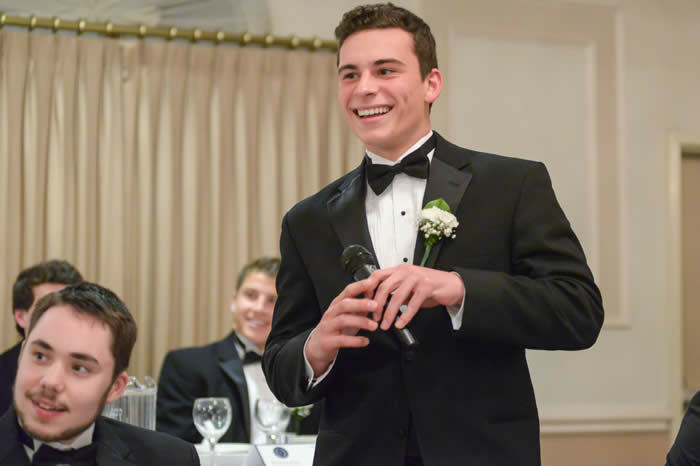 It was Connecticut’s answer to Rhode Island’s first score: a 49-yard touchdown pass from University of Rhode Island signee Nick Dionizio to Zach Pezza on the game’s second series. Washington’s go-ahead pick-6 came on the first play from scrimmage following Connecticut’s tying score. Washington’s touchdown stood up until the fourth quarter when Connecticut finally pulled away. Killingly’s Spencer Lockwood, the reigning Gatorade Player of the Year, turned a short pass into a big gain into Rhode Island territory to end the third quarter. It set up Zajack’s second touchdown pass, a 20-yarder to St. Joseph’s Jared Mallozzi, his future CCSU teammate, early in the fourth quarter. “Kyle’s a tough kid. We knew he could do it,” said Lockwood, who will play at Trinity College. “He knew when Shea went down he was going to have to step up — we didn’t have any other quarterback, so he was going to have to. Campbell’s hit and forced fumble gave Connecticut the ball back at the Rhode Island 24. Zajack repaid the favor with an 11-yard strike to Southington’s Tim O’Shea, which put the game away. Casinelli was named Connecticut’s defensive MVP. 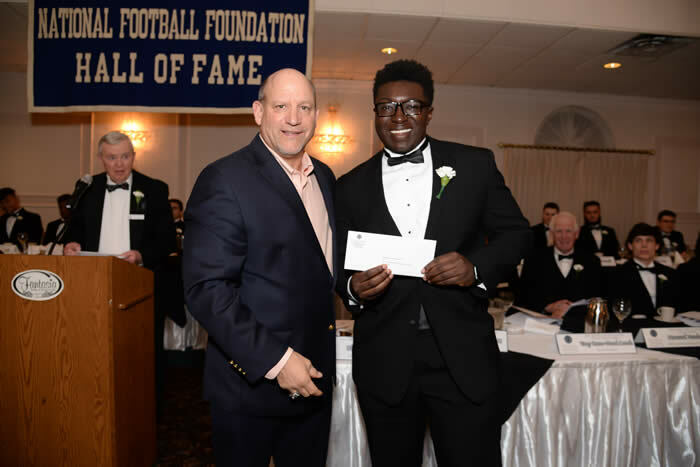 Platt’s Zavian Arroyo was Connecticut’s Coaches Award winner. 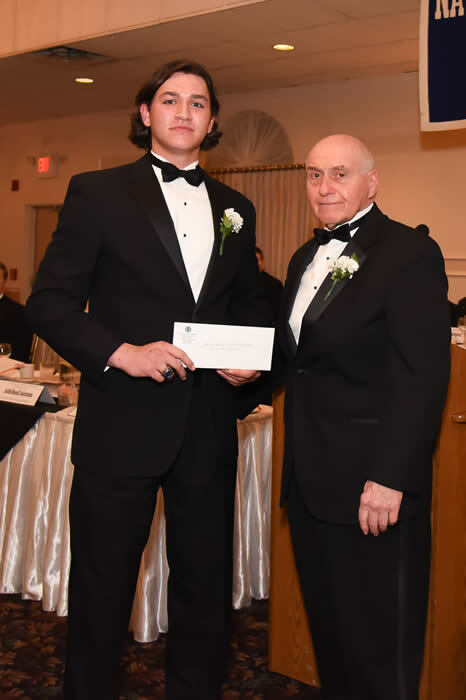 J.P. Mason of Bishop Hendricken was Rhode Island’s defensive MVP. Dionizio was Rhode Island’s offensive MVP. Moses Brown was Rhode Island Coaches Award winner. 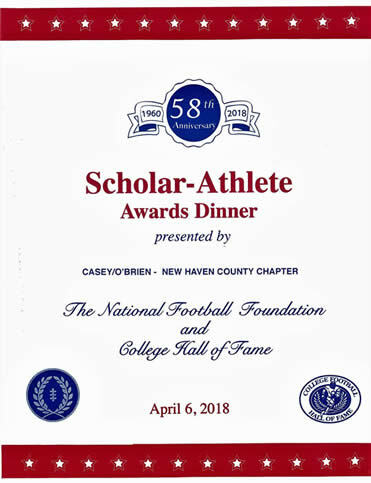 The scholar athlete awards dinner begins each December when the Selection Chairman sends out letters to the coaches and Athletic Directors of the chapter's 33 member schools asking if they have any senior student athlete candidates who played football, excelled in the classroom and is involved in their community to be considered for the scholar athlete honor. 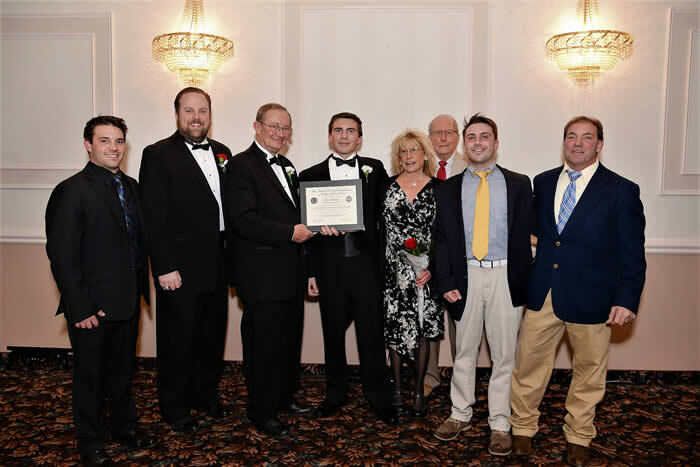 The Board of Directors of the Chapter met in January to discuss the candidates and vote on their selection. 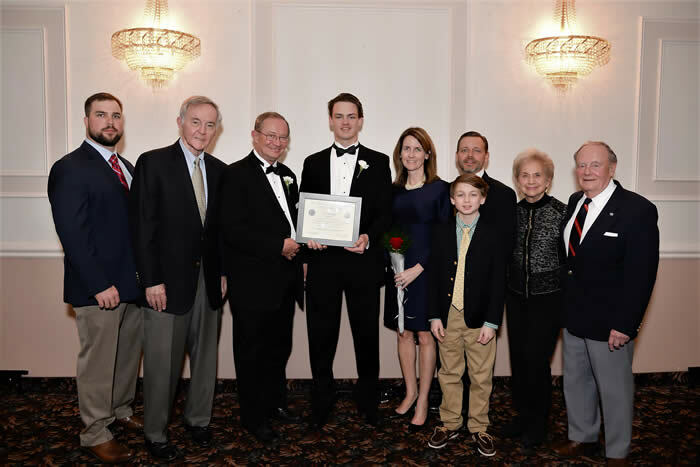 Other award winners are also discussed as well and a date was set for a reception on February 15 at the Floyd Little Athletic Center in New Haven. 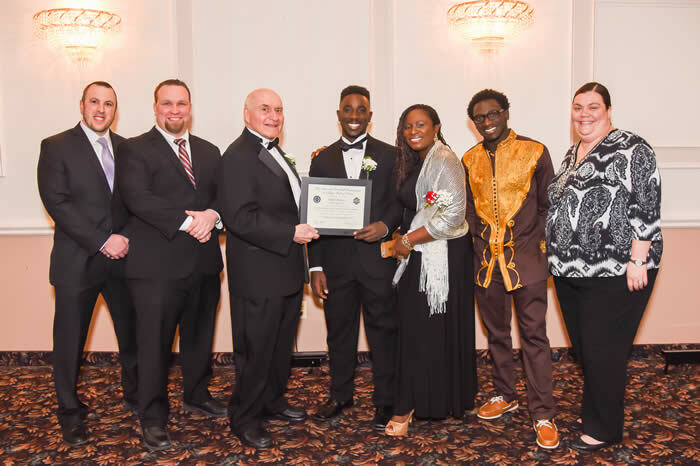 The scholar athletes, their parents and coaches are asked to attend to go over information about scholarships, tickets, ads, where to order their tuxedo's for the dinner, and to have their pictures taken for our press releases. 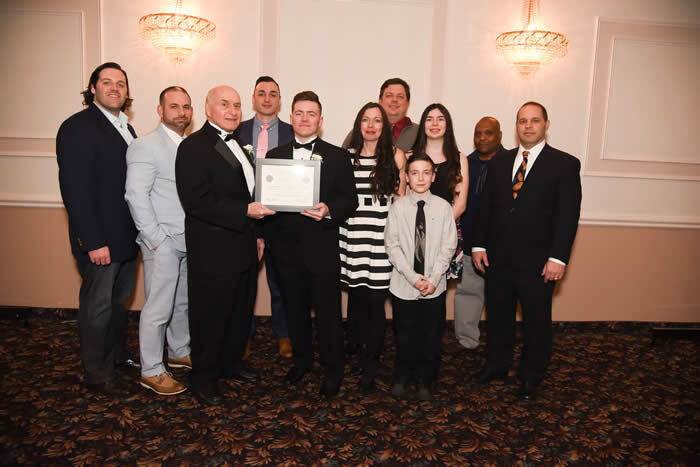 The 58th Annual Scholar athlete dinner was held at Fantasia in North Haven on Friday April 6 2018 and twenty-nine scholar athletes were honored along with long time official Richard J. Moran Jr. who received the Official Recognition Award and David Mastroianni coach of the Hand Tigers winners of the Class L State Championship. 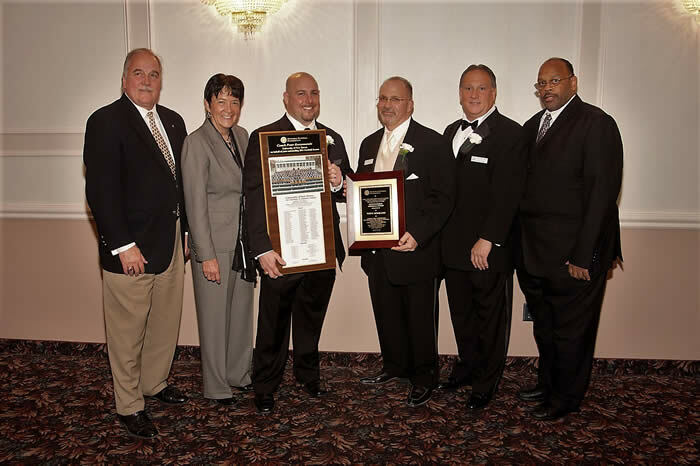 Other award winners included Yale coach Tony Reno who received the Chapter Award of Merit for leading the Bulldogs to the Ivy League Championship, their first outright title since 1981 and Yale's retiring Athletic Director Tom Beckett who concluded a record-setting 24 year tenure that completely transformed Yale's athletic department in every way from reconstructing the athletic facilities to enhancing its endowment. 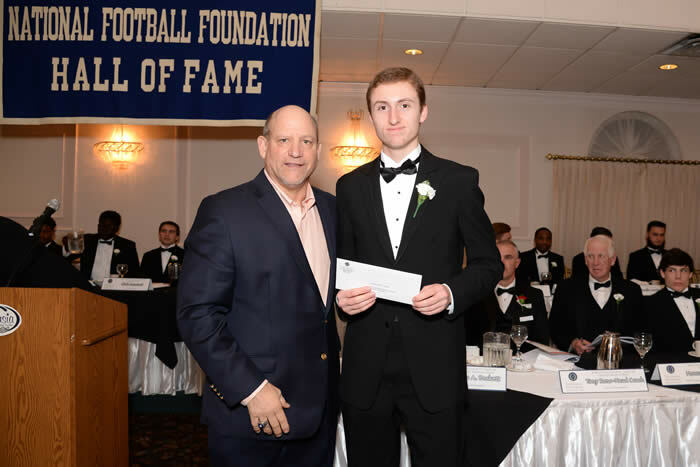 Both Hand and Yale were presented with championship plaques that included team rosters and results for the year on them and twelve scholarships totaling $10,000 were awarded. 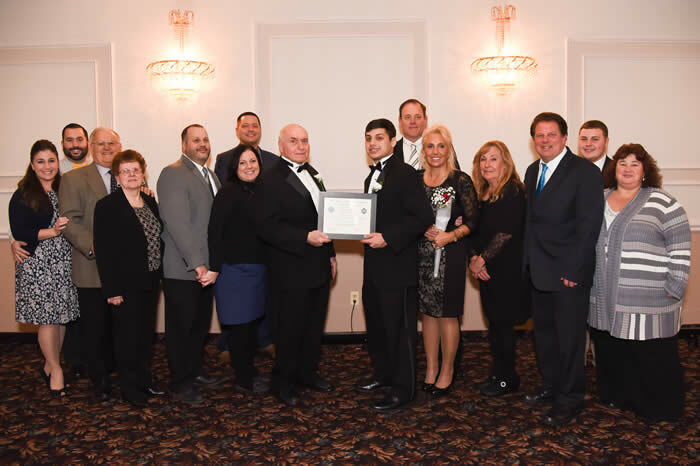 Over 325 attended this year's dinner. 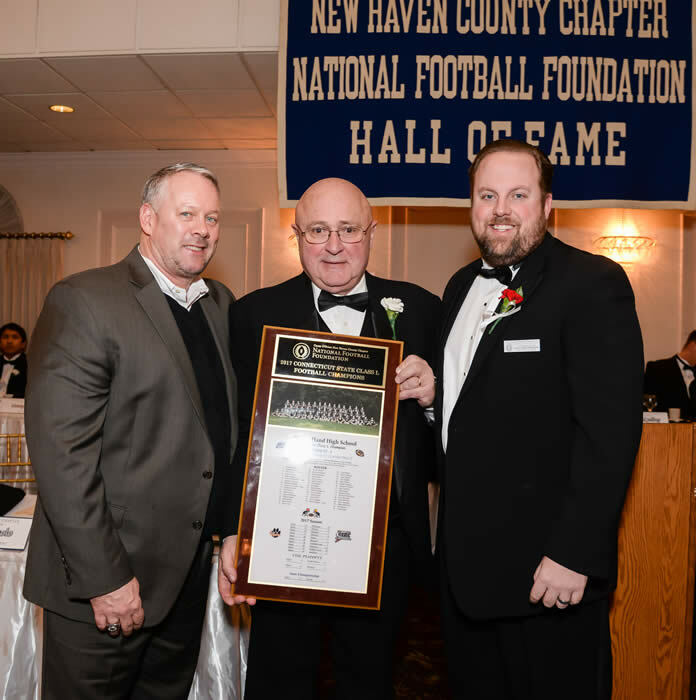 Chapter member Anthony 'Tony' Sagnella coach of the North Haven Indians was recognized, along with several other Washington Redskin replacement players in March, with Super Bowl rings for their being part of that 1987 team. The NFL players went on strike that lasted three games and the Redskin replacement players, who were selected to replace them, won all three games before 'the regulars' returned to action. The club finished 11-4 for the season. An ESPN '30 for 30' production told the story that the replacement players didn't receive rings that year and it led to the Redskin organization finally recognizing them for their contribution to the team's success. 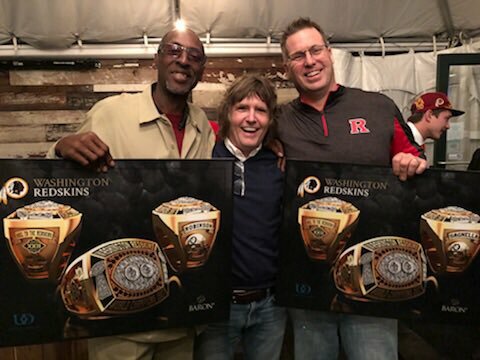 Coach Sagnella is shown with Tony Robinson the replacement quarterback hold renderings of the rings they have since received. 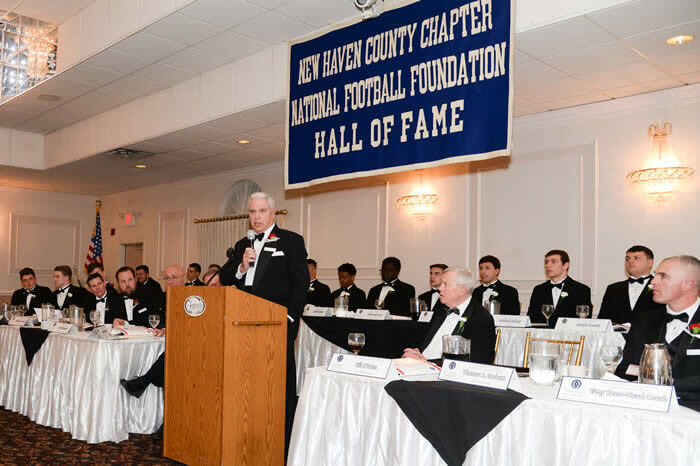 This past fall the Casey-O'Brien New Haven County Chapter of the National Football Foundation held three meetings for members and guests in September, October and November. A wide variety of speakers attended to talk about a variety of interesting subjects. 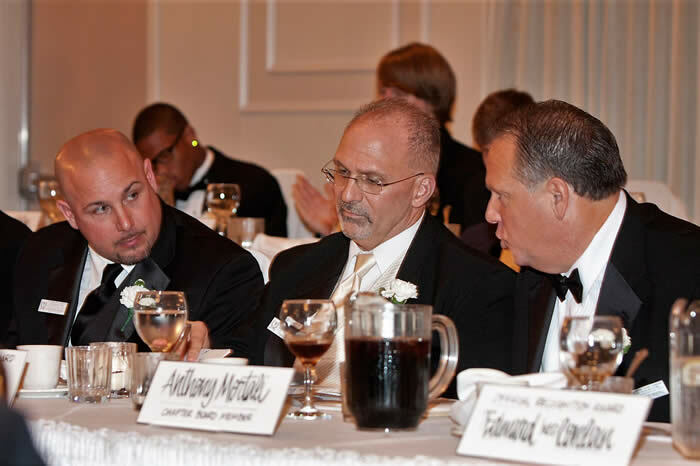 In September CCSU coach Peter Rossomando talked optimistically about his current Blue Devils club. 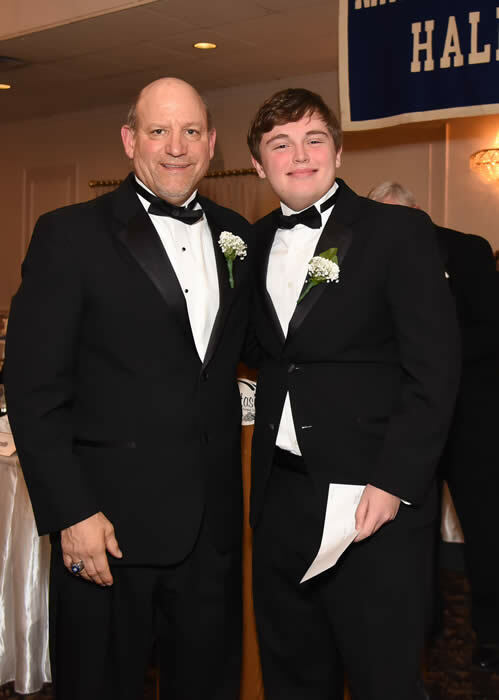 Baseball's Bob Wirz spoke about his book 'The Passion of Baseball' and former Branford and SCSU football player Dave Callahan spoke about the loss of his late son Ben 10 who died in July in a tragic swimming accident. 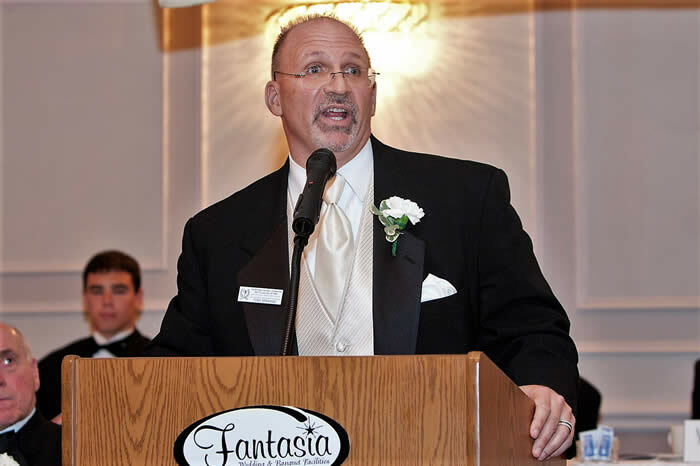 At the October meeting coach Tony Sagnella of North Haven spoke about his experience as a member of the 1987 Washington Redskins during the strike year where he was one of the replacement players that went 3-0 before the NFL players returned and won the Super Bowl. There was plenty of talk going on at that time spurred by an ESPN 30 For 30 production about those players getting rings for the success they had contributed to the Redskins that season. The final meeting in November is always dedicated to having our chapter coaches who are in the hunt for a CIAC championship to speak about their season and what's ahead in the playoffs. 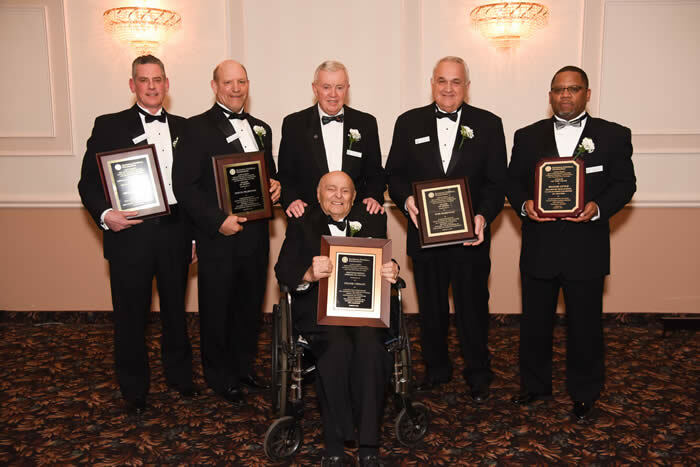 Legendary West Haven coach Ed McCarthy introduced coaches Reggie Lytle (Hillhouse), Tom Brockett (Ansonia), Donald Drust (Cheshire), Jeff Roy (Shelton) and Rich Boshea (West Haven). Everyone had a delicious prime rib dinner provided by caterer Mark Lynch at this very popular chapter event. 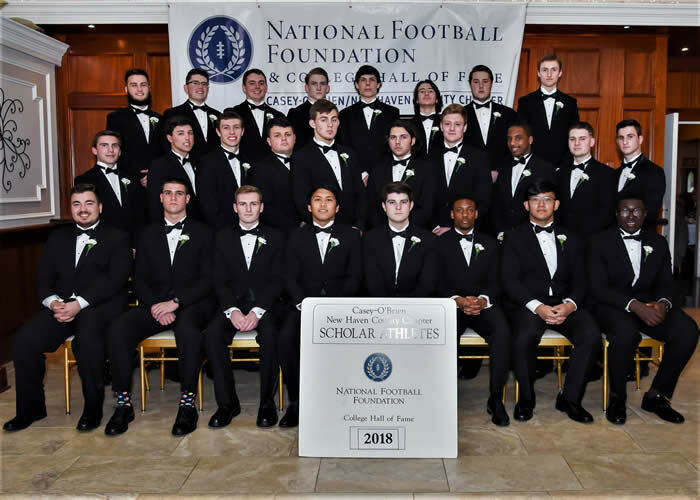 The 58th anniversary of the Casey-O'Brien Chapter of the National Football Foundation and College Hall of Fame Scholar Athlete awards dinner will be held on Friday April 6 at Fantasia Banquet Facility 404 Washington Ave. North Haven. A reception will begin at 5:30 pm with the march to the head table at 6:30 pm. 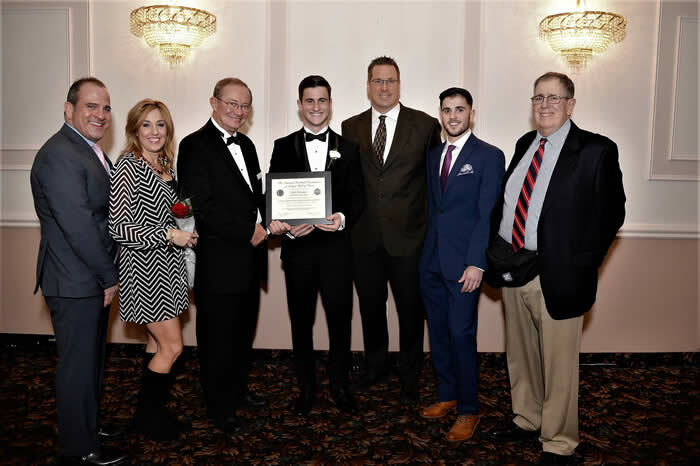 Twenty-nine high school and prep school athletes who play football will be honored for academic excellence, leadership and citizenship. 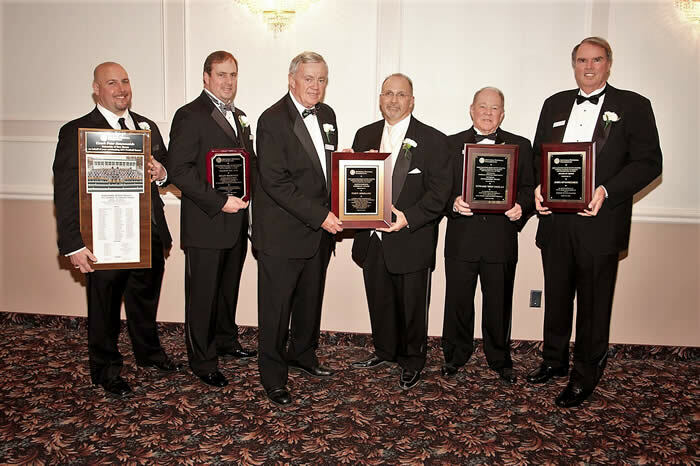 "Once again we will be honoring an outstanding group of young men", said Bill O'Brien chapter president. 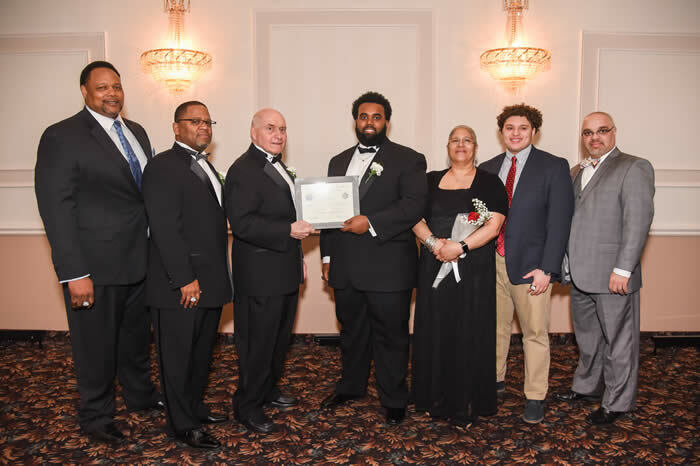 "Their accomplishments in the classroom, on the field and in the community bring honor and distinction to their parents, their schools and their community. 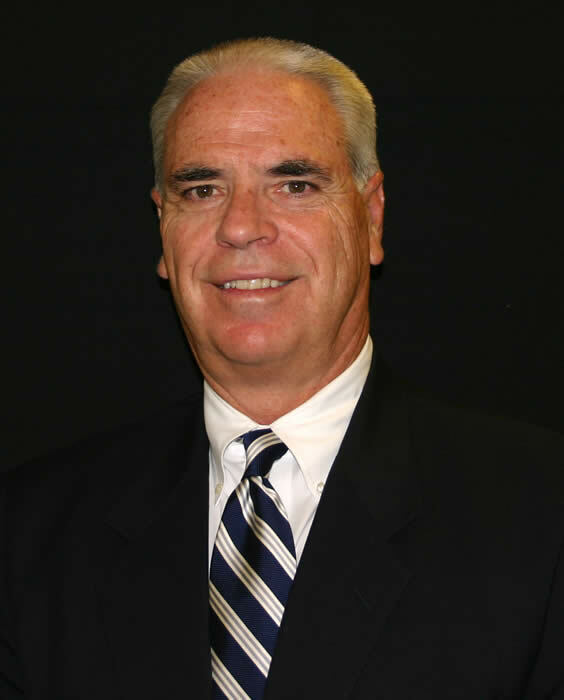 In addition the Chapters Distinguished American Award will be presented to Yale Athletic Director Tom Beckett who will retire in June. 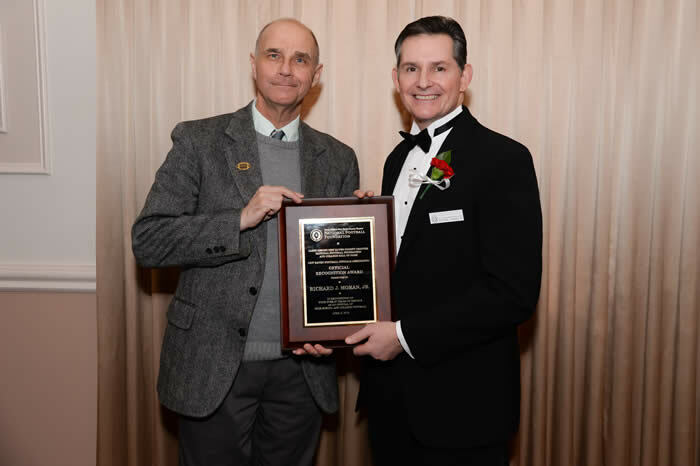 "Tom Beckett has had an illustrious 24 year career at Yale. His achievements over the years at Yale are legendary", said O'Brien. "New and improved athletic facilities, significant growth in athletic endowment, 128 championships, 73 Ivy League titles, 43 Olympic athletes and 337 All Americans in all sports are simply amazing". 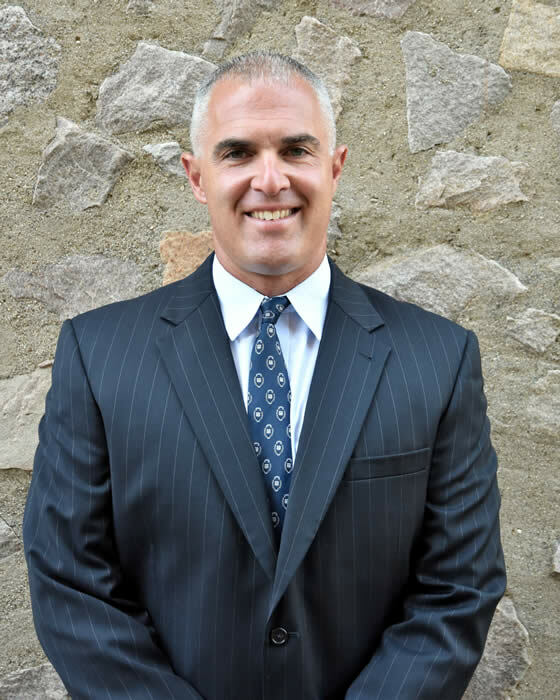 The Chapter Award of Merit will be presented to Yale Coach Tony Reno who led the Bulldog's to the 2017 Ivy League championship, the school's first outright league title since 1980. Yale finished with a 9-1 record with their only blemish being a one point loss to Dartmouth. 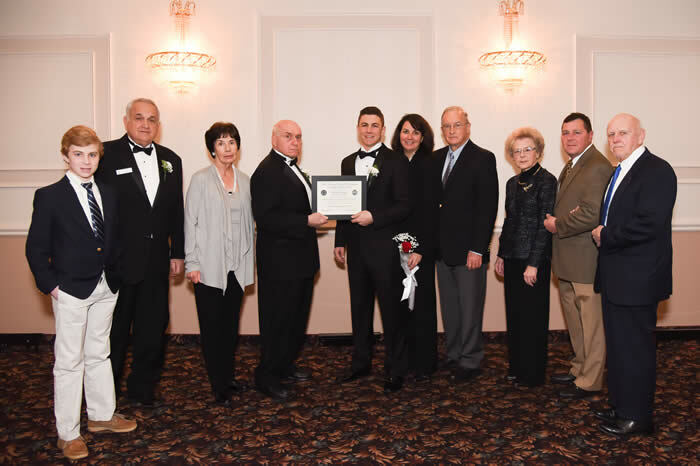 "We are very pleased to present the Chapter Award of Merit to Tony Reno', said O'Brien. 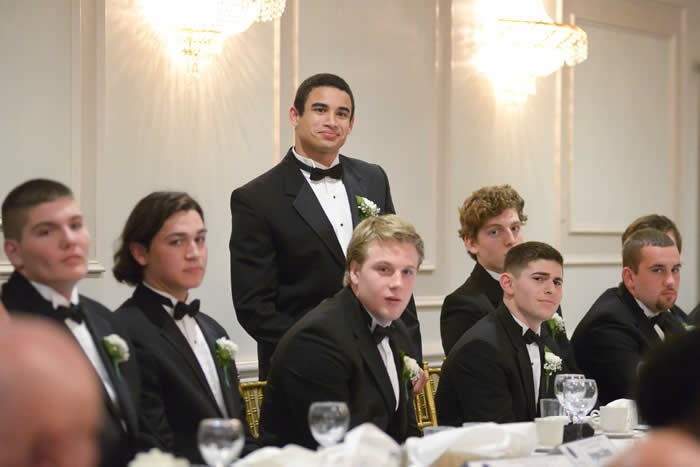 "What a great season he led the Bulldogs to, winning Yale's first outright Ivy title in 37 years". 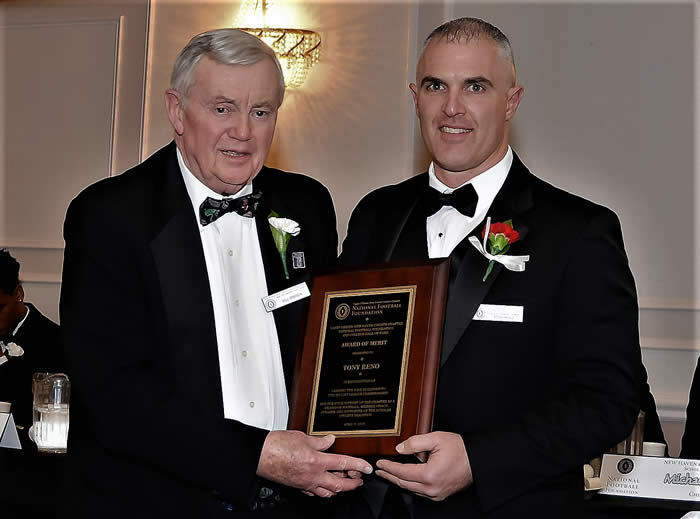 For his success he also earned Coach of the Year honors from the New England Football Writers and the Gridiron Club of Boston. 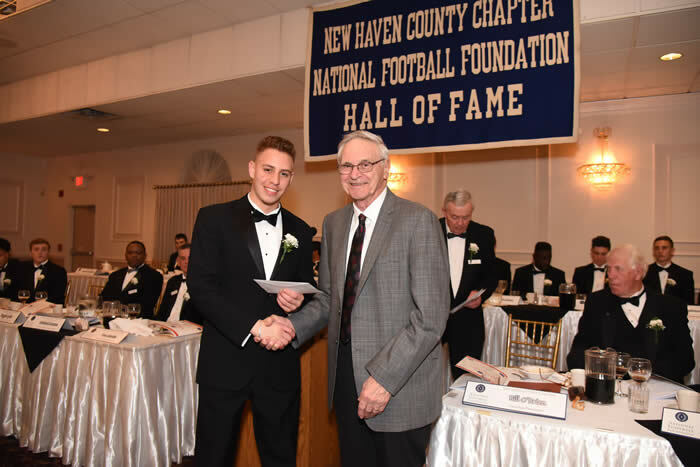 Other award winners include Richard J. Moran Jr. of North Haven, a 27 year member of the New Haven Football Officials Association who will receive the Officials Recognition Award and Daniel Hand football coach David Mastroianni who will receive the Coach of the Year Award for leading the Tigers to a 12-1 record, the Class L Championship and the #3 state ranking. 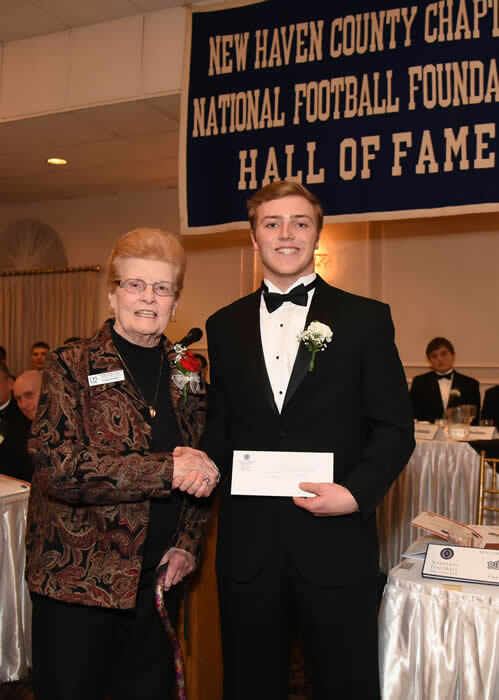 Tickets can be purchased for $50 each by sending a check payable to the "National Football Foundation' to Donna Limone, 10 Ludlow Court, Branford 06405 or calling her at 203-481-8375. The Casey O'Brien New Haven County Chapter had 17 players chosen to play in the 2017 Super 100 Classic All Star game played on Saturday June 24 at Veterans Memorial Stadium in New Britain. 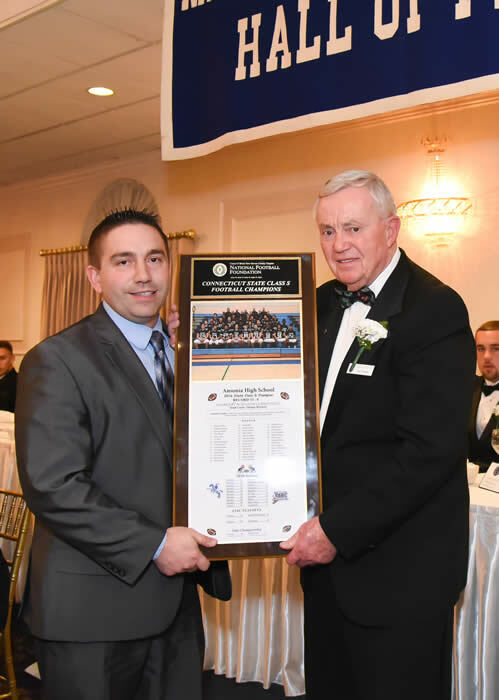 The game is presented by the Connecticut High School Coaches Association. 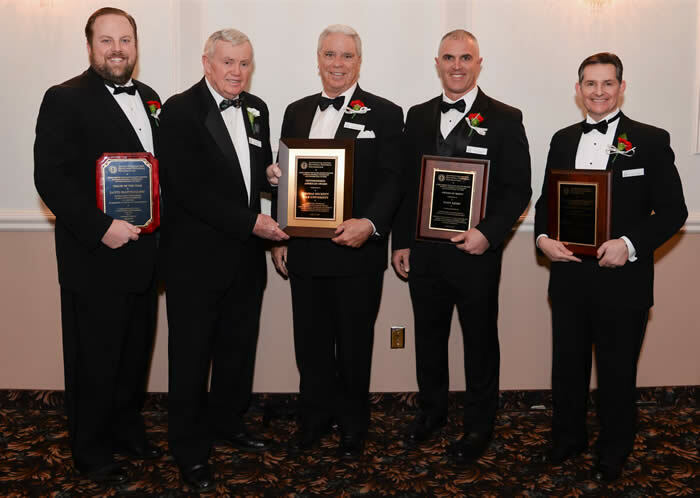 In addition chapter coaches Jason Bruenn of Platt High School and Jeff Bevino of Foran High School were selected as head coaches and former Shelton Athletic Director Jim Benanto was selected to receive the prestigious Larry McHugh Distinguished Service Award. 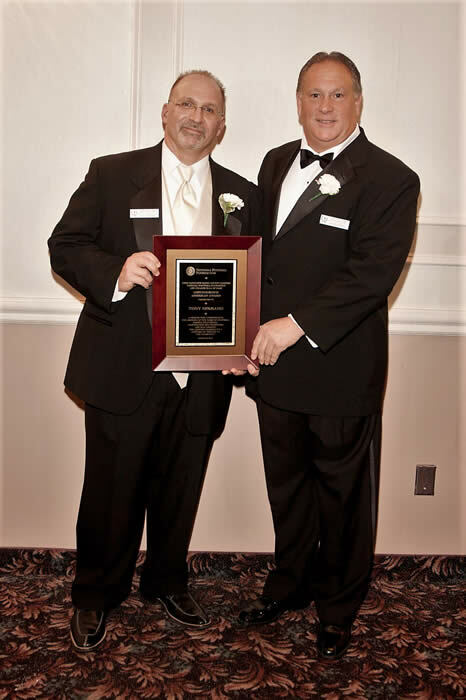 Former Hand coach Steve Filippone was co chairman along with Len Corto the Athletic Director at New Britain High School. Amity's Colin Beaulieu was selected Offensive MVP for Team Nutmeg and Platt's Tylon Papallo was selected MVP for Team Constitution. The Coaches Awards were won by Danny James of Sheehan and Parker Rowley of Xavier. The game turned out to be exciting. After Team Constitution took a 27-0 halftime lead team Nutmeg rallied in the second half but fell short losing 27-22. Congratulations to all involved. 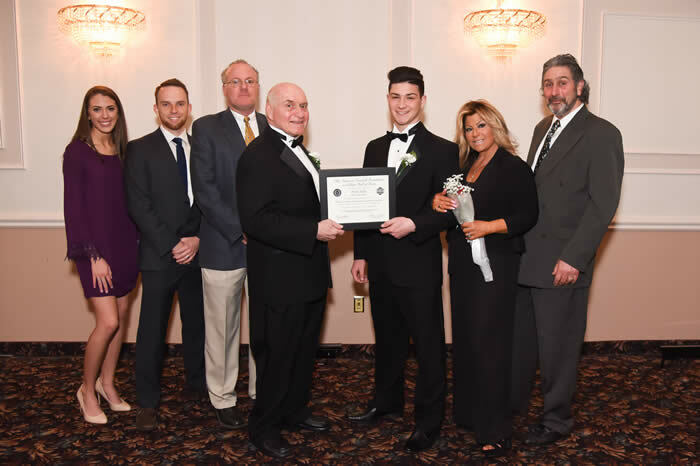 The Casey-O'Brien Chapter held our 57th Annual Scholar Athlete banquet at Fantasia in North Haven on Friday March 31 before a audience of 315. 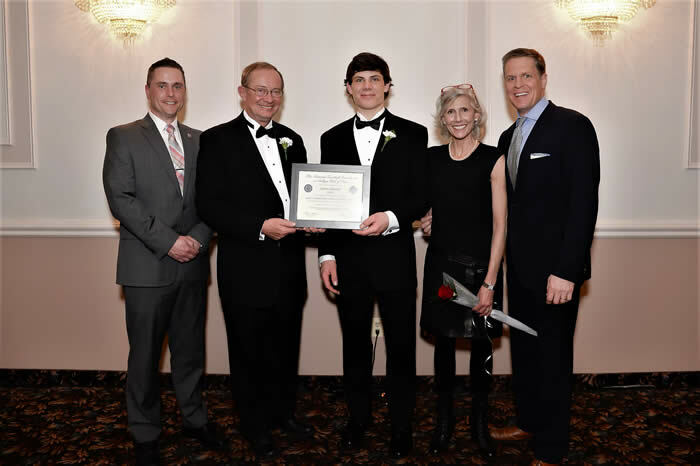 This year we recognized another noteworthy groups of honorees including 27 outstanding young men for their outstanding achievements in the classroom, in the community and on the football field bringing the total over the years to over 1200. 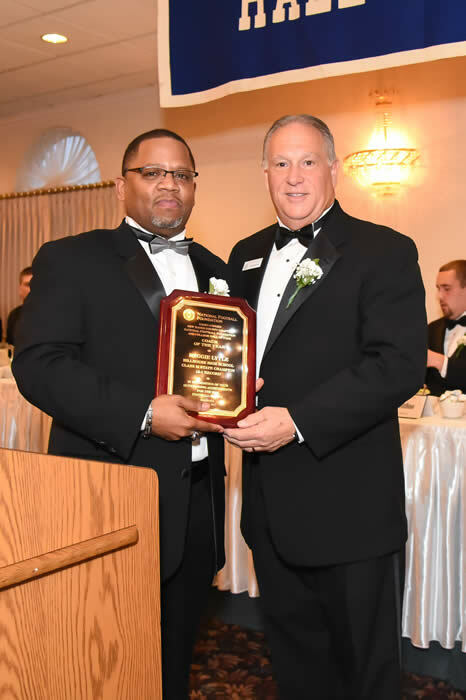 In addition awards were presented to 22 year official Michael Moran who received the Official Recognition Award and Reggie Lytle coach of Hillhouse, the Class M State Champions, with the Coach of the Year Award. 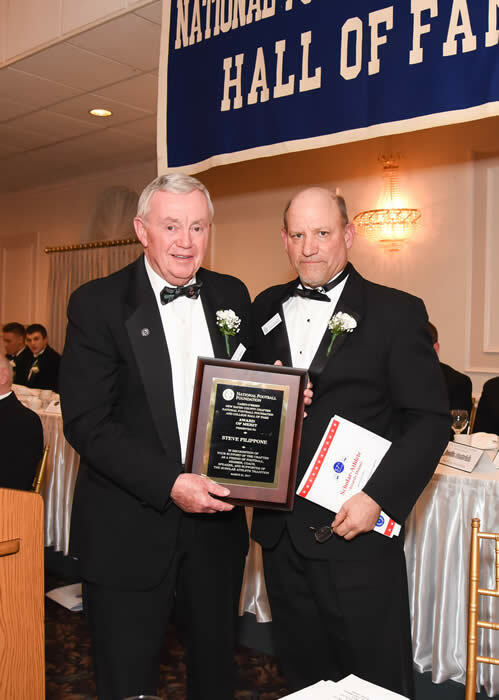 In addition the Distinguished American Award was presented to retired legendary coach Frank Crisafi of East Haven and the Chapter Award of Merit was presented to Tom Marcucci of Notre Dame and Steve Filippone of Daniel Hand two long time coaches who both retired at the conclusion of the 2016 season. The three former coaches have won a combined 583 football games between them. State Championship awards were also presented to Class M champions Hillhouse and Class S champions Ansonia. 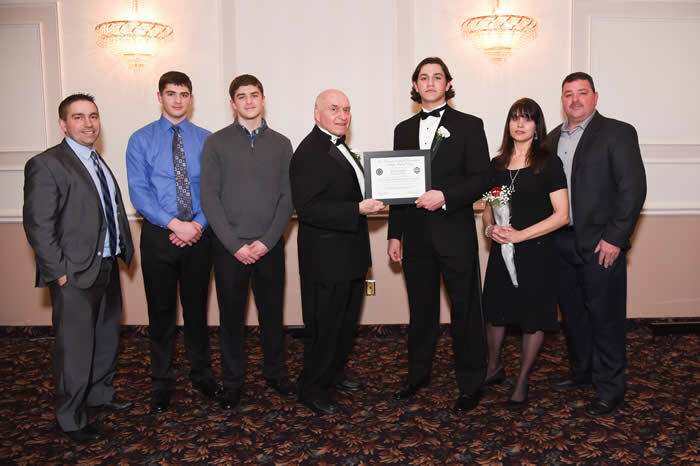 Back in February the scholar athletes and their parents and coaches met at the Floyd Little Athletic Center to review information about the dinner concerning tickets, ad's, scholarships, tuxedo's and to have their pictures taken to release to the media announcing their honor. 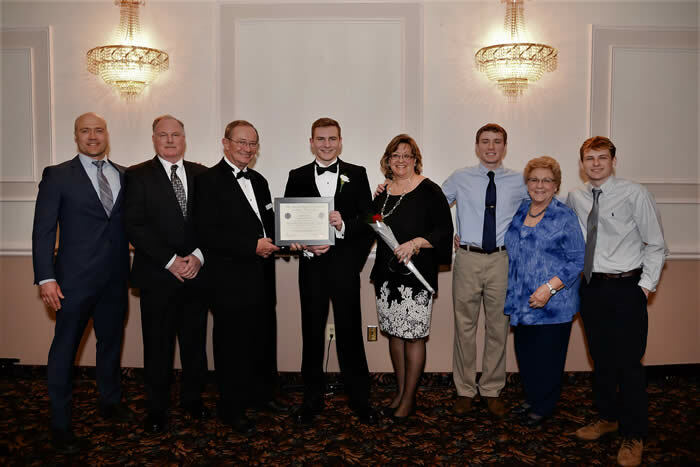 At the dinner the scholar athletes had their pictures taken in their tuxedos with their family members present and their coach. They then posed for a group photo before marching to the head table to the music of "Mister Touchdown". 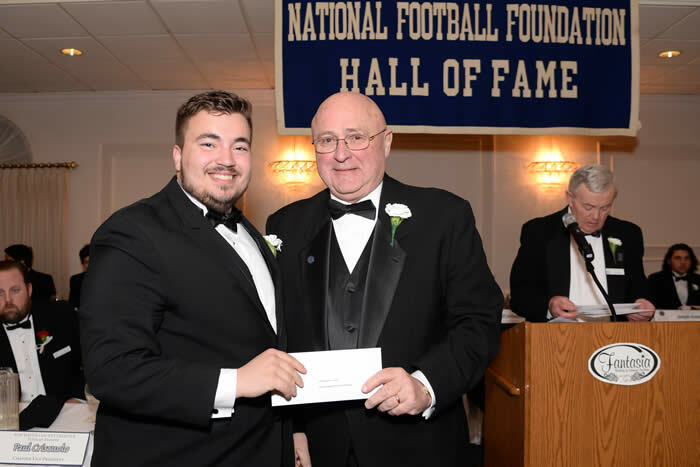 Several awards were presented before dinner and Northeast Region Coordinator of the National Football Foundation, Howie Vandersea, told the audience of the latest developments of our national organization. The scholar athletes were introduced by Dan Martin who asked each one a question about their high school years and future plans. 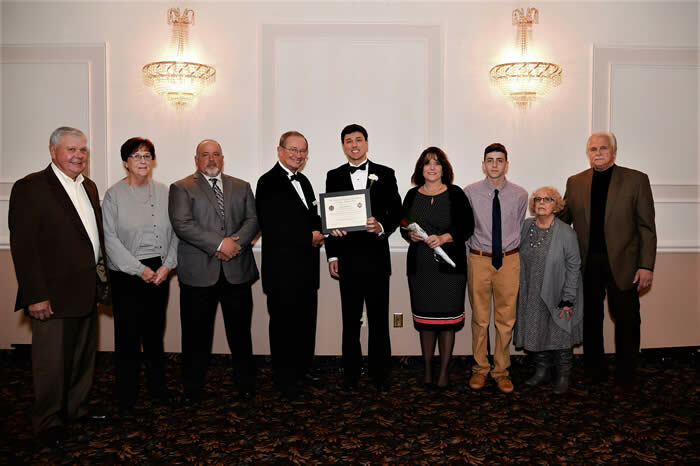 Other awards were presented and $7500 in scholarships were awarded. 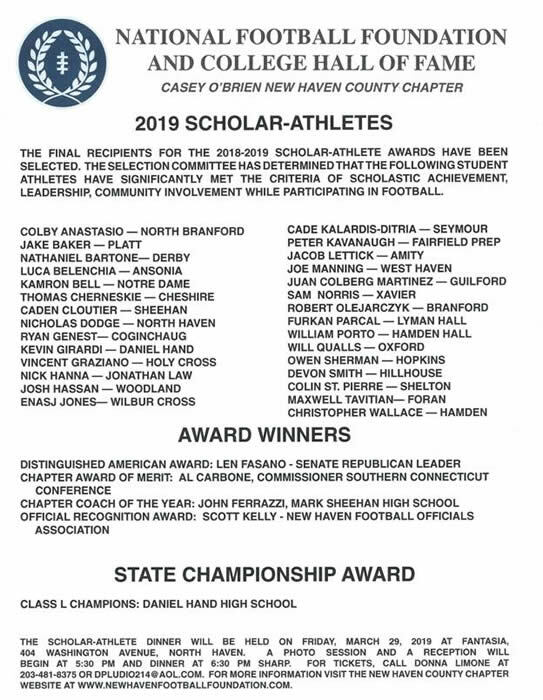 The Casey-O'Brien New Haven County Chapter will be honoring 27 scholar athletes who have excelled in the classroom and played the great game of football at the chapters 57th annual banquet on Friday March 31 at Fantasia 404 Washington Ave, North Haven. 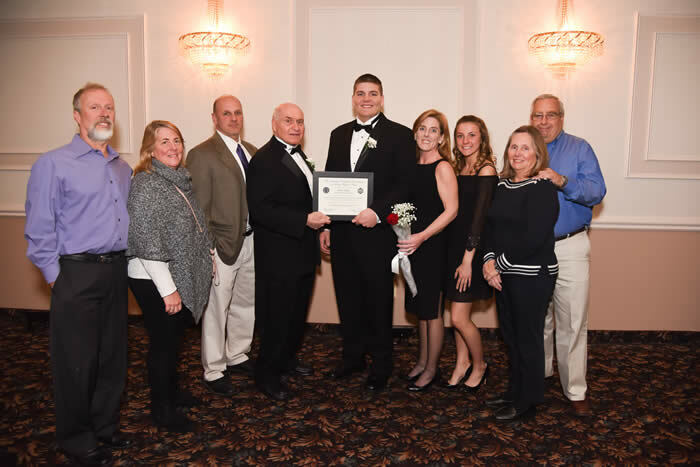 In addition other award winners include legendary coaches Frank Crisafi of East Haven, recipient of the Distinguished American Award Tom Marcucci of Notre Dame and Steve Filippone of Daniel Hand winners of the Chapter Award of Merit who have won a combined 583 football games. In addition Hillhouse coach Reggie Lytle will receive the Coach of the Year Award. The Academics won the Class M State Championship this past year and finished with a 12-1 record. 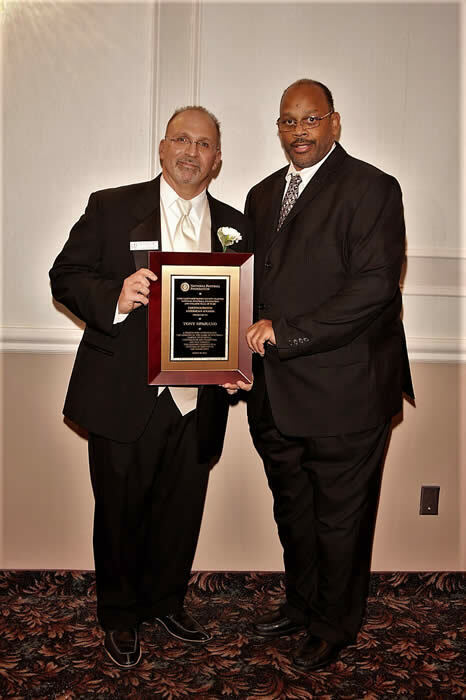 The Official Recognition Award will be presented to Michael Moran a 22 year official who has officiated 5 CIAC playoff or championship games. Tickets cost $50 and can be purchased by calling Donna Limone at 203-481-8375. Two former chapter scholar athletes recently finished their playing careers at Yale. Peter Gerson (L) of Hand and Sebastian Little of Cheshire dressed for their last home game in Yale Bowl in the game against Princeton. Peter was a scholar athlete in 2013 and Sebastian in 2012. Well done guy's. Best wishes in your future activities. At the chapters last fall meeting the Tuesday before Thanksgiving eight coaches vying for a spot in the state playoffs were invited to speak about their season and upcoming game's. 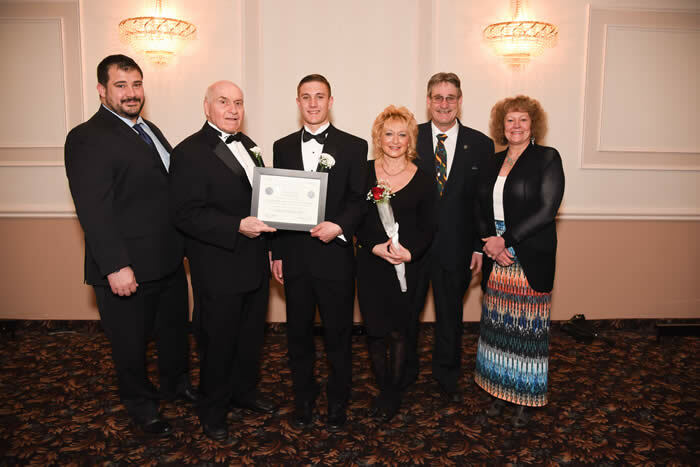 A crowd of 65 members and guests attended at the Knights of St Patrick and were treated to an excellent prime rib dinner served by caterer Mark Lynch. Our Chaplin Rev Owen Sanderson gave the invocation. In addition to speaking each coach was interviewed by Erik Dobratz of WTNH 8. 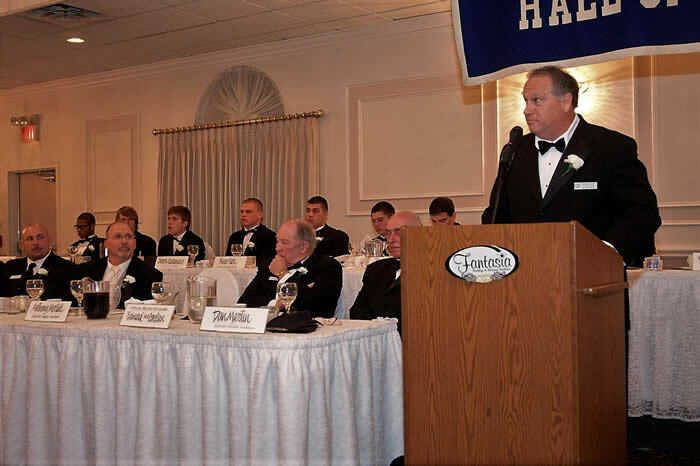 Speakers included Rich Boshea (West Haven), Jeff Roy (Shelton), Tom Marcucci (Notre Dame), Jason Bruenn (Platt), Tom Brockett (Ansonia), Don Drust (Cheshire), Tom Lennon (Seymour) and Reggie Lytle (Hillhouse). The always entertaining Ed McCarthy, retired coach of the West Haven Blue Devils, brought some levity to the night as our last speaker. Chapter Chaplin the Reverend Owen Sanderson gave the Invocation. Caterer Mark Lynch scoops up the ziti for the hungry members. 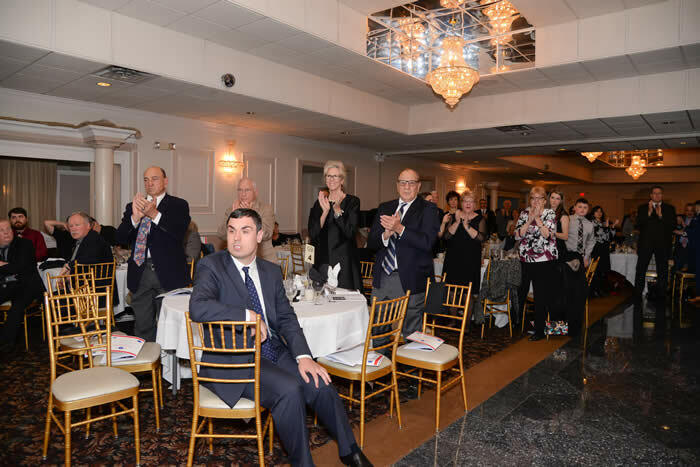 Our second fall meeting for October brought out 40 members who were treated to an excellent program of speakers and the always delicious and abundant meal from Mark Lynch Caterers. 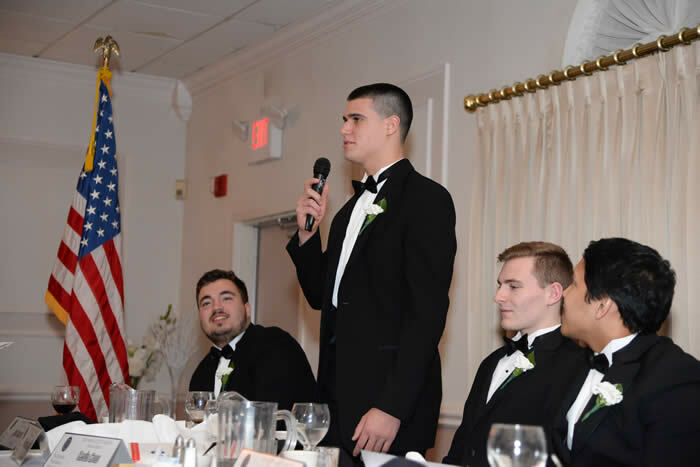 Thanks to the Knights of St Patrick for hosting us, for Fran our bartender hostess and to UNH coach Chris Pincince, CCSU Associate AD of Communications and Quinnipiac journalism professor Rich Hanley for giving informative and entertaining talks. The first meeting of the season was held on September 22 at the Knights of St Patrick and 44 members attended. 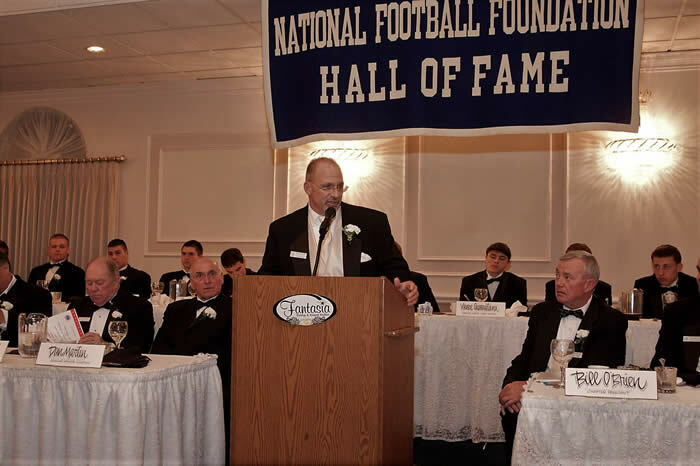 Speakers at the meeting included long time football official Bill Riccio who spoke about the recent rules changes, long time friend Peter Rossomando head coach at CCSU and John Pierson and Erik Dobratz from WTNH 8 who asked for interesting stories about members, players or people involved in our programs. 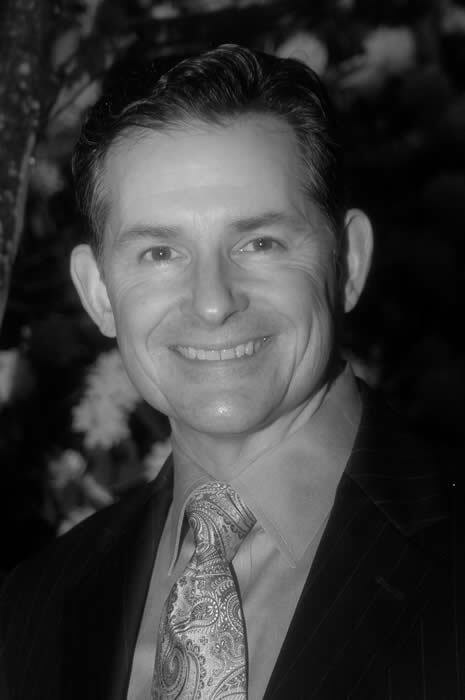 Members were encouraged to contact John or Erik directly at WTNH. Kim Pirelli and Mark Lynch Caterers served another outstanding meal. The next two meetings will be on October 20 and November 22. 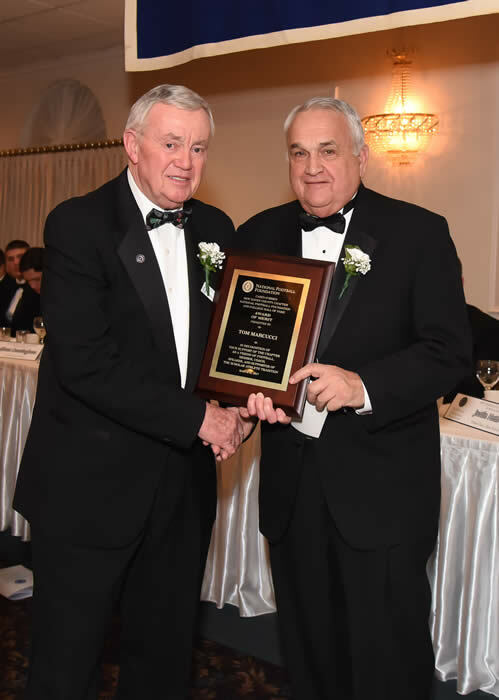 Congratulations to our long time chapter member and coach Ed McCarthy for his induction into the National High School Athletic Coaches Association Hall of Fame in Louisville Kentucky last week. 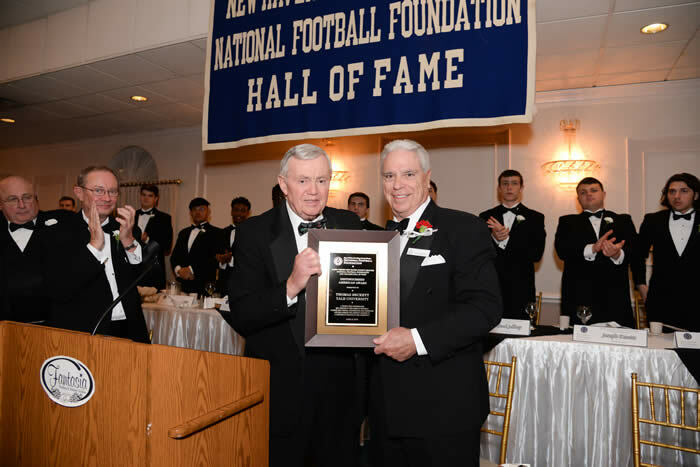 Coach McCarthy won a total of 332 games the most in the history of the State of Connecticut. 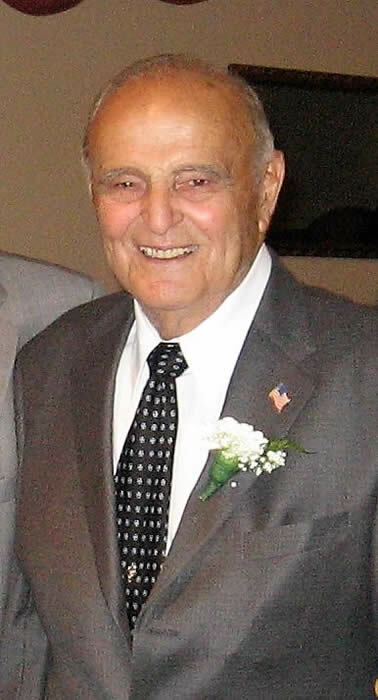 In his 40 plus years he won seven state championships including four at West Haven and three at St Joseph's. 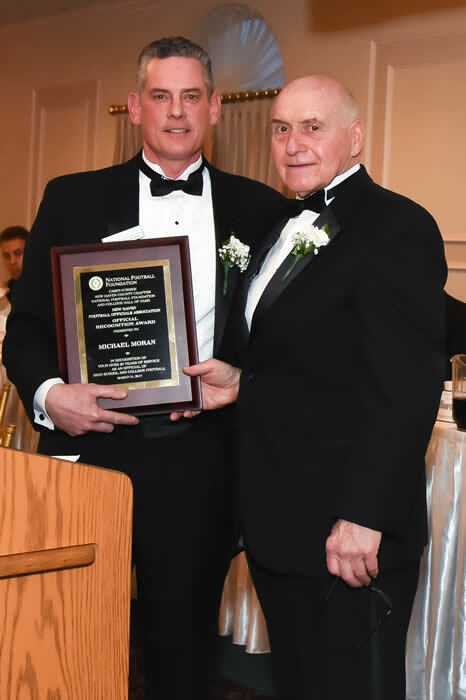 Our chapter was there on October 25 2013 when he won his record breaking 322nd game and again when we recognized him on November 26, 2013 presenting him with a commemorative plaque celebrating his record. Congratulations again coach we are proud of you.